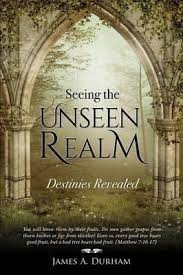 Seeing in the Unseen Realm | Karmal Books online Christian books and media store. Do you know your true identity and purpose in the Kingdom of God? Do you have a clear picture of how the Lord see you when you fulfill your Kingdom destiny and accomplish His purposes for your life? It is time to see into the unseen realm and get a clear picture of the answer to these and many other questions. "Essential revelation from heaven that is a "must understand" to accomplish your destiny." Sid Roth, Host, It's Supernatural!" And now I'm going to tell you who you are, really are. You are Peter, a rock. This is the rock on which I will put together my church, a church so expansive with energy that not even the gates of hell will be able to keep it out. (Matthew 16:18, TMG) James has served in ministry for more than 48 years, including 13 years as a pastor and church planter and almost 30 years as an active duty army Chaplain. James retired from the military at the rank of Colonel. In 2010, James and his wife, Gloria, retired from the pastoral ministry and moved to Columbia, South Carolina in order to write, teach seminars around the world, and mentor many spiritual sons and daughters. James is a graduate of Oklahoma State University with a Bachelor's Degree in Psychology and Perkins School of Theology, Southern Methodist University, Dallas, Texas with a Master's degree in Theology.